Freedom 251 Smart Phone online booking by www.freedom251.com started today Feb 18th 2016 at 6AM : Heya guy’s are you guy’s are waiting to register India most affordable smart phone freedom 251 at price Rs. 251. This smartphone developers take care of all things which can helps to reach this Freedom 251 cheap phone to everyone as soon as possible. Freedom 251 registration gates opened today early morning 6AM. Actually this smartphone gained huge popularity among online people. Main reason for this popularity as usually cheapest price we ever seen. 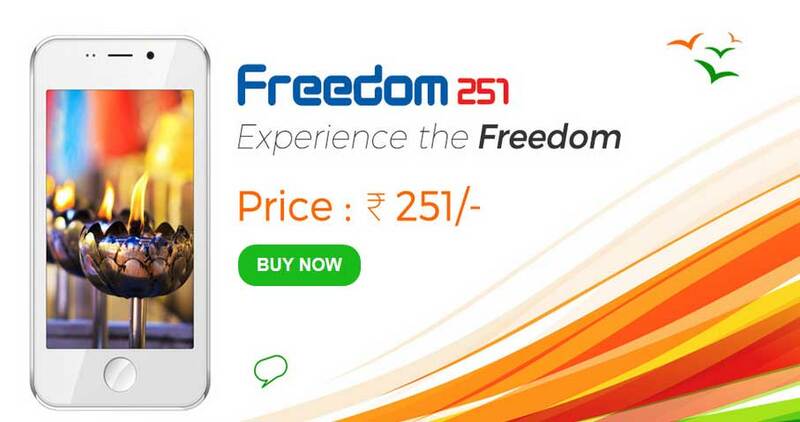 Freedom 251 smartphone developed by Ringing Bells PVT LTD which was started in year of 2015. Some interesting facts are guy’s from US, UK and other countries are trying to book this mobile via their Indian friends. So that you can understand how engaged this freedom 251 mobile to all over mobile users. Freedom 251 online booking or registration has started today early morning with huge cloud of Indians. Freedom 251 smart phone developers given one awesome tag to this phone that is ” Experience the Freedom”. It simply fabulous tagline for this kinda mobile. If you are facing Freedom 251 Website servers crashing or payment option not working then go through this mentioned URL it may give useful info for you. Official www.freedom251.com servers crashing because of very high cloud of users. All users are trying to register for this cheapest mobile in India. Lot internet surfers searching lot queries like how to book/register my freedom 251 mobile online, freedom smart phone features/specification, Is freedom 251 mobile booking is a Scam ?, Low price mobile in India freedom 251 registration, how to get this freedom mobile phone etc etc ?. So, here for our blog readers we provide few useful info about Freedom 251 Online Booking or Online registration or how to book freedom251 at Rs. 251 rupees. Registration for this freedom 251 mobile simple just straight forward. Follow up these few steps to get this awesome Freedom 251 mobile phone or to register/book freedom 251 at Rs. 251 Indian Rupees. Note : Freedom 251 Booking Starts on 18th Feb 6AM 2016 and Bookings ends at 8.00 PM on 21 Feb 2016. Delivery date of this Freedom 251 mobile is after 30 June 2016. Visit Official Freedom 251 blog via this URL http://www.freedom251.com/ to start booking. On front page you will see “Buy Now” Option. Just Tap on it to proceed to payment. Just fill up your address details like Gmail, Phone number and delivery address and proceed to payment. Add your Cart Details and Submit it. Save your confirmation details for future use. That’s it. Before booking or ordering Freedom 251 mobile it’s good idea to know the best feature’s of latest trending Freedom 251 smart phone/mobile phone. Freedom 251 mobile also have some pre installed apps like Swachch Bharat, Fisher Man, Farmer, Women Safety, Medical and we can get apps like Facebook, WhatsApp, Google Play Store via Phone. Ringing Bells Freedom 251 Mobile Phone Customer Care Numbers : 0120-4001000, 4200470, 6619580. Price is also very Good Surenjan Sarder. 🙂 Register your Freedom 251 now to enjoy with this awesome cheapest Smart Phone. I LIKE I VERY MUCHHHHHHHHHHHHHHHHHHHHHHHHHHHHHHHHHHHHHHHHHHHHHHHHHHHHHHHHHHHHHHHHHHHHHHHHHHHHHHHHHHHHHHH! I need 3 mobiles my number 9788726636. address:Tamilnadu inside virudhunagar ,85B I.puliyankulam inamreddiyapatti (po).